This luxury apartment situated in the heart of Edinburgh's New Town is only 10 minutes walk to Princes Street. 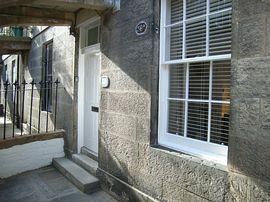 This property is the ideal base to explore Edinburgh. 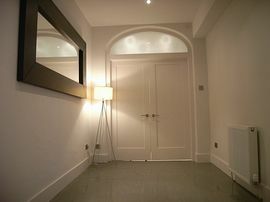 The apartment is situated in a quiet street with it own main door. In Edinburgh discover museums and galleries or stroll through the leafy open spaces that surround the city centre, or watch the cosmopolitan world go by from one of the many pavement cafes. From the world famous Festival to top-class restaurants and bars, from shopping to culture, you'll be spoilt for choice. 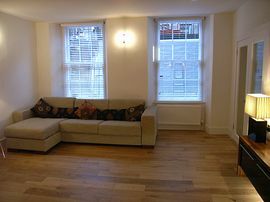 Entrance hall, large sitting room with large corner sofa bed, dining area and well equipped kitchen area with ceramic hob, oven and microwave. 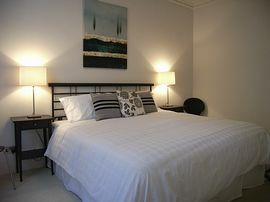 Large double bedroom with zip link bed providing superking double or two singles. Contemporary shower room with large walk in shower, wc and wash hand basin. Linen and towels provided. Electricity included. Digital TV, DVD/CD player, microwave, fridge, dishwasher, ceramic hob, washing machine. Quiet street in Edinburgh's Georgian New Town. 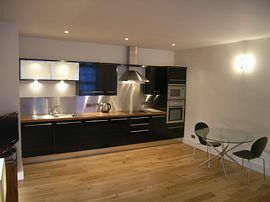 Local Services: Less than 10 minutes walk to Princes St. Local shops, bars and restaurants within a few minutes walk. The A1 stops at the east end of Princes Street. Turn right from Waterloo Place on to Leith Street. At roundabout take the first exit left onto York Place leading to Queen Street. Turn right into Howe Street (sign posted Comely Bank) and then take 4th road on right for Cumberland Street. Take the A90 following signs for the city centre. When on Queen Street take the 2nd road on left into Howe Street (sign posted Comely Bank) and then take 4th road on right for Cumberland Street. Prices from £50.00 - £150.00 per night depending on season. Discounted rates for bookings of 3 or more nights.